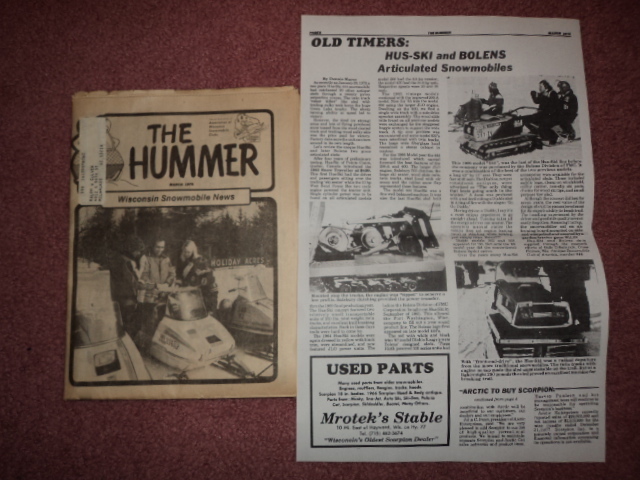 In the 70’s, the Wisconsin Snowmobile News was distributed to those who were members of a local snowmobile club. The paper was called “The Hummer”. Dave and Renee Peterson attended the 2010 Hus Ski / Diablo Workshop and brought the article along. After reading it, I thought it would be worthwhile to reprint the commentary on our site. Enjoy. 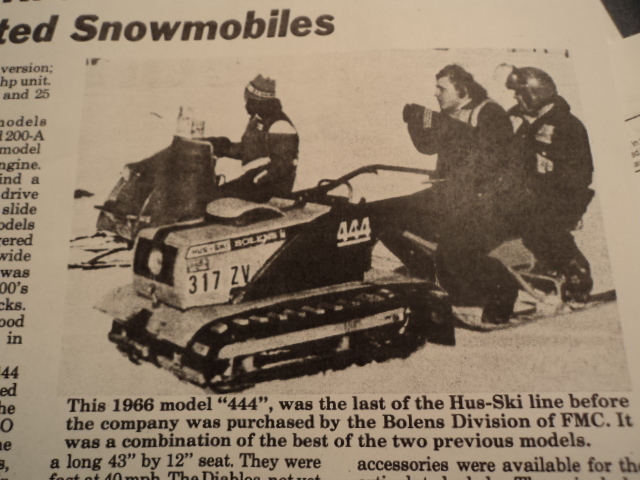 As recently as January 29, 1978, a two piece Hus-Ski 444 snowmobile had outclassed 20 other antique sleds through the serpentine course. The twin track “rotor tiller” like sled with trailing sulky took home the huge Green Lake trophy. The sharp turning ability at speed led to victory. However, the tired (or strong) arms and lots of flying powdered snow tossed from the wood cleated track and trailing wood sulky skis was the price paid for victory. Factory data says the unit can turn around in its own length. After four years of preliminary testing, Hus-Ski of Pointe Claire, Quebec, Canada introduced the 1963 Snow Traveller at $499. 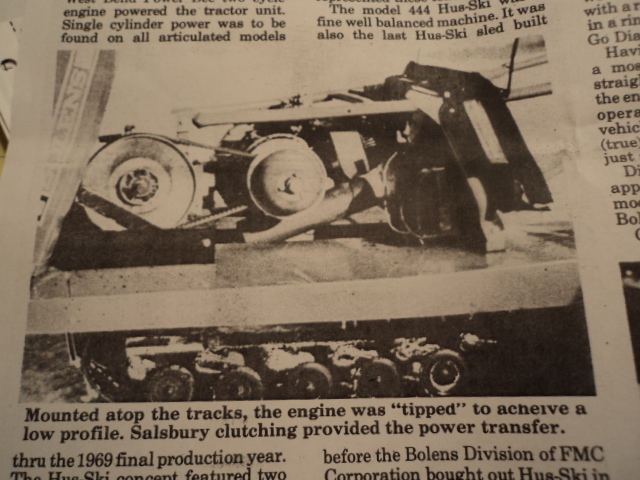 The first Hus-Ski had the driver and passengers sitting over the trailing “ski seater” while the 10 hp West Bent Power Bee two cycle engine powered the tractor unit. Single cylinder power was to be found on all articulated models thru the 1969 final production year. The Hus-Ski concept featured two relatively small transportable units of 250 lbs. total weight, twin tracks, and excellent trail breaking characteristics. Back in these days trails were hard to come by. The 1964 Hus-Ski models were again dressed in yellow with black trim, were streamlined, and now featured JLO power units. The model 200 had the 8.8 hp version: the model 400 had the 10.4 hp unit. Respective speeds were 20 and 25 mph. The 1965 vintage models continued with the improved 200-A model. New for 65′ was the model 600 using the larger JLO engine. Dwelling on the 600, we find a single wide track with a side drive sprocket assembly. The wood slide rails found on all previous models were exchanged for the staggered boggie system to support the wide track. A tip over problem was encountered and some model 600’s were retrofitted with twin tracks. The large wide fiberglass hood resembled a steam cabinet in contour. For the 1966 Model year the 444 was introduced which carried forward the best features of the 200-A and 600. The larger JLO engine, Salsbury 503 clutches, the large ski seater, wood slide rails, twin tracks, steel hood with air scoop and the rubber snow flap represented these features. The model 444 Hus-Ski was a fine well balanced machine. It was also the last Hus-Ski sled built before the Bolens Division of FMC Corporation bought out Hus-Ski in September of 1965. This allowed the Port Washington, Wisc. company to fill out a year round product line. The Bolens logo first appeared on late model 444’s. The red with white and black trim 67′ model Diablo Rouge’s were Bolens’ designed sleds. These Hirth powered 500 series units had a long 43″ by 12″ seat. They were fast at 40 mph. The Diablos, not yet considered antiques, were advertised as “The only thing that beats going south in the winter”. A decal was produced with a red devil riding a Diablo sled in a ring of fire with the slogan “Go Go Diablo”. Having driven a Diablo, I say it’s a most unique experience to go straight ahead. Turning takes all the energy a driver can muster. The operators manual states the vehicle does not require leaning (true) or standing when turning, just simply relax. Relax??? Diablo models 502 and 503 appeared for 68′. Not until the 69′ model year did the conventional Bolens Sprint arrive. Over the years many Hus-Ski accessories were available for the articulated sleds. These included saddle bags, clamp on windshield, utility carrier, non-slip ski pads, chains for wood ski tips, and an all purpose tow sled. Although the concept did last for seven years, the real value of the design should be remembered most for its superb ability to break trail. The handling experienced by the driver and good ride quality are not easily forgotten. Summing it all up, the snowmobiler sat on an ironing board mounted on skis and was pulled and steered by a garden tractor gone WILD! Hus-Ski and Bolens data supplied through the research efforts of Gale Urbainzick, Cross Plaines, Wis. Antique Snowmobile Club of America, member #44. This 1966 model “444” was the last of the Hus-Ski line before the company was purchased by the Bolens Division of FMC. It was a combination of the best of the two previous models. Mounted atop the tracks, the engine was “tipped” to achieve a low profile. Salsbury clutching provided the power transfer. 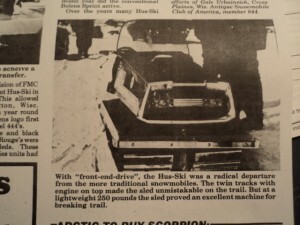 With “front-end-drive”, the Hus-Ski was a radical departure from the more traditional snowmobiles. The twin tracks with engine on top made the sled unmistakable on the trail. 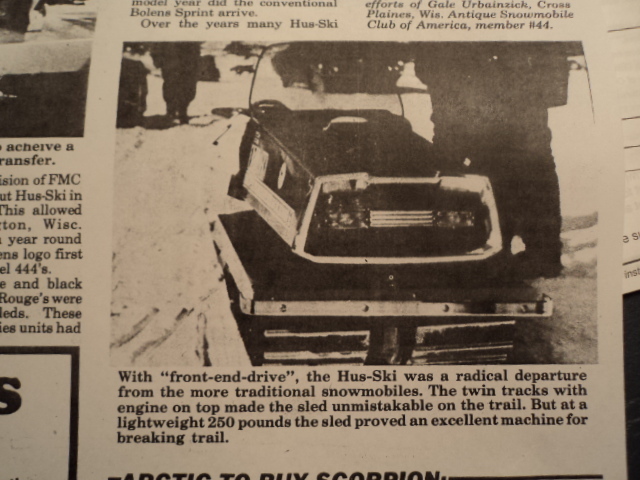 But at a lightweight 250 pounds the sled proved an excellent machine for breaking trail.